Steve Vai excited? Wait till you see him jam on some Hendrix later this year! 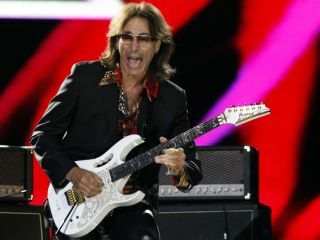 Steve Vai has been announced as a featured performer on the autumn run of the wildly successful Experience Hendrix Tour. This will mark the first time that the all-star lineup of music greats celebrating the music of Jimi Hendrix will crisscross the US in a single calendar year. The concert tour will launch in Pittsburgh, Pennsylvania on 26 October and hit 19 markets over the course of three weeks including Montreal, Toronto, New York, Boston, Atlantic City, Detroit, Indianapolis, Cincinnati, and other eastern and mid-western locales. Other artists slated for the tour include many returnees from past Experience Hendrix excursions, including Eric Johnson, Kenny Wayne Shepherd, Robert Randolph, Jonny Lang, Los Lobos' David Hidalgo and Cesar Rosas, Ernie Isley, Living Colour, Chris Layton of Stevie Ray Vaughan and Double Trouble and The Slide Brothers a/k/a Chuck and Darick Campbell of Sacred Steel. As was the case with last spring's Experience Hendrix Tour, Fender Musical Instruments Corp. is the event's lead sponsor. Participating sponsors also include Dunlop Effects Pedals, Marshall Amplifiers and Mapex Drums. Always a special treat for audiences, special guests are expected to sit in at many of the dates, making the concerts all that much more memorable for both new and veteran Hendrix fans. Past participants have included Joe Satriani (who played all the dates earlier this year, and blogged from the tour for MusicRadar), Paul Rodgers, Hubert Sumlin, Buddy Guy, Carlos Santana, Robby Krieger and others. Anchoring the tour is the one and only Billy Cox, the legendary bassist who met Jimi Hendrix when the two met while serving in the US Army's 101st Airborne Division. The two bonded over their love of music and later worked together in Band Of Gypsys. "It's always a great thrill and honor for me to play Jimi's music for audiences now just as it was in the 1960s," said Cox, who has been a part of all Experience Hendrix Tours. "[These concerts have] shown how timeless this music really is, and it's just wonderful that we've continued to get an infusion of new, very enthusiastic artists to participate and are able to offer the most wide-ranging Jimi Hendrix-related repertoire possible." Kenny Wayne Shepherd, a veteran of several Experience Hendrix Tours, had this to say: "Jimi Hendrix's music has really inspired me to push the limits of my own music. He didn't observe any boundaries. He was an amazing player and a tremendous showman, so I incorporated some of his showmanship in what I do."